Earlier this week, I woke up in a small town, smelling of something. It wasn’t anything bad. In fact, it was pretty good: sweet, caramel-like, and roasted, with a vague, but lingering aftermath of alcohol following it. It wasn’t something I was used to, but I’d tasted so many Cognacs this week in the town of Cognac, that it was literally wafting out my pores. And I’m not complaining. Three days in the region is barely enough time to scratch the surface of this well-known brandy, which honestly, I didn’t know all that much about when I was invited to the annual Cognac auction, where bottles worth thousand of euros are bid on by a few lucky (and loaded) individuals. 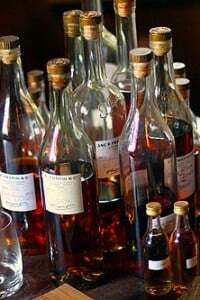 But the first thing I learned about Cognac, is that it all starts in the barrels at the tonnellerie, or cooperage, where the barrels are made. As I touched on in my post about fresh shelling beans, and several people left their own thoughts in the comments, we’re often unaware of what actually goes in to producing the food—and beverages, that we feed ourselves. For example, I had no idea that it takes three years, minimum, just to make each barrel that’s used for aging. 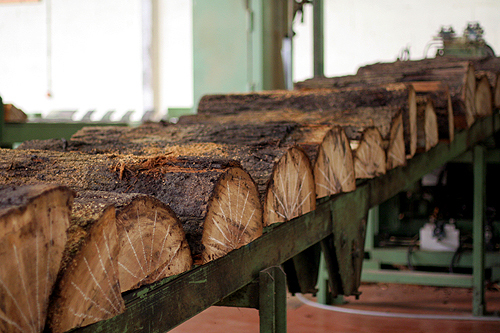 From the selection of oak, mostly from France (with some coming from the US), the wood that these men get needs to be cured for a minimum of two years with an alternating system of watering, then drying, during which time it changes color and becomes less-porous, and starts its journey to becoming a barrel. One thing that struck me is that even though we’re living in a pretty modern age (that is, except for my telephone and internet provider*), barrel-making hasn’t likely changed all that much in the last few centuries. 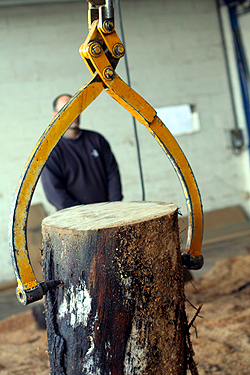 Sure there’s machines to cut the wood, but the finishing and banding is all done by hand. 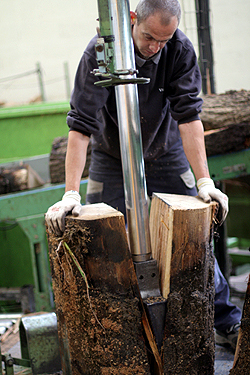 And I was surprised to see that they even make the saws that they use to cut the wood by hand as well. If there’s any outsourcing, I didn’t seen any evidence of it. Aside from ensuring that the men in the region don’t need to go to the gym, the long curing of the barrels reduces their humidity so when the distilled liqueur is stored in there, only 3- to 4% evaporates every year, which is called the Part des anges, or the angel’s share. So not only does the Cognac age in these barrels, but the flavors become more concentrated and take on that deep, aged color courtesy of the coopers. The youngest Cognac, VS (Very Special) is aged around 2 years, VSOP Cognac (Very Superior Old Pale) is aged for at least 4 years, and the most time one would spend in one of these barrels is 70 years. I didn’t know what all those terms meant before I came here, but like anything, the taste of what’s in the glass is much more important than the terminology. And I tasted quite a few new and old Cognacs, and although I have a preference for the more mature specimens, younger isn’t necessarily worse. I mean, for brandy. It’s vaguely amusing when you’re trying to buy a light bulb or masking tape and no one will help you, but it’s another thing when you’re cut off from all forms of communication and they make the situation impossible to resolve, even in person. So excuse any typos, grammatical errors, or bêtises, while I work and post from various places. I have a feeling that the real attraction wasn’t the cognac, but the coopers (and I don’t mean Alice C). Enjoy the view! I have a question about the VS and VSOP labeling. It is my understanding that the French are very careful about letting “in” foreign phrases that will pollute their lovely language. So…per your article the VS and VSOP stand for English words and not French? There is a disconnect here somewhere. I am not saying you are wrong, but there must be a very good reason for this. I am a BIG fan of your blog by the way! Martha: They were awfully sweet fellows : ) But I was equally impressed with the work that they were doing…too. FWG: Glad you like the site! Here’s a list of Cognac appellations, from the French Wikipedia site. (The official Cognac site lists them, too, but because they use flash animation, I’m unable to link to individual pages.) Perhaps since a majority of the Cognac market is overseas–France is only 3% of the global market, that may be why they use terms in English. 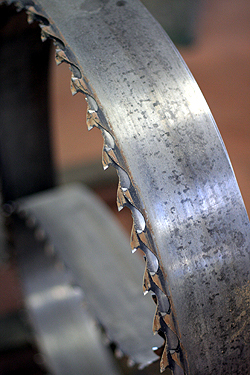 Michaela: Aside from the mecs, I loved the saw that they were making. They were watching me take pictures of it–they must’ve thought I was nuts! I love le reportage, those pictures are gorgeous ! David- Your photos keep getting better and better! They are amazing in this post. Love the bokeh in the one of you with the glass. Sorry to hear about the trouble with your internet/phone provider. That would be one of the most supremely frustrating things that could happen! Hope you wade your way through it soon. We have TWO internet providers as we can’t be without net as we both work on the net. We did this because we also went without service for weeks and the problem only got resolved, because my husband is knowledgeable enough to have solved it on his own. How horrid it must be for someone who has to depend on the provider to fix a problem! Wonderful post, great photos and writing. Just when I thought this food blog couldn’t get any better, you produce a lovely article on cognac. Lovely photos in so many ways! How long have you been with your ISP? If your initial term of engagement is over (often just 12 months), you can cancel your service within 10 days (don’t let them tell you otherwise!). You simply need to write a Lettre recommandée avec accusé de réception (you can do this on line with La Poste now, it’s wonderful) informing your ISP of your decision. They must cancel your subscription within 10 days of the receipt of your registered letter (this is according to the provisions of the “Loi Chatel” article L.121-84-2 which came into effect in June 2008). 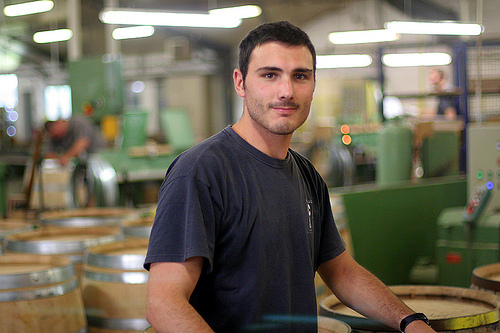 I visited the Tonnellerie Taransaud just outside Cognac a couple of years ago, and I must say that seeing loads of young men with no shirts on hammering away with their old-fashioned tools was quite a treat. That put apart, learning about the process of barrel making was quite something, too. As David says in his post, it has basically not changed for the past few centuries. 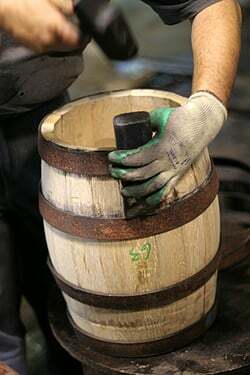 Barrel making is a really skilled job! MichelleB: That’s a good solution! I was hoping to get an iPhone, to have internet back up, but France Telecom won’t let me upgrade to one, with a more expensive plan, until January. I’m not sure of their reasoning, since they’d be making a lot more money. When I told the guy at the FT office that, he agreed, but didn’t offer to let me switch. Tone: Yes, it is very old-fashioned. Everyone had their shirts on, but maybe I need to go back next July. Marlowe: Like my cell phone, my contract with Numericable (which the French call, l’enfer, or hell, for those out there who don’t speak French..) expires in January. However Krysalia emailed me that you can write a certified letter giving them 15 days to respond. Then if they don’t respond, you can send another certified letter telling them you’re quitting. So I’ve started the process…and by mid-October, I should be free and clear of that company once and for all. Hopefully. btw: I went to La Poste to send letter #1 just after my breakdown in the Numericable office this morning, the woman at the post office was as nice and as sweet as can be, and very helpful. It goes to show that although the French aren’t known for customer service, it does exist. Just not at Numericable. Oh, lucky you, to have gotten to watch them make those lovely barrels, and from the log, up, no less. My favorite little winery in the Anderson Valley (Navarro) always notes what kind of barrels they age particular wines in, and French barrels are noted for many of the reds. Of course, most are gigantic barrels, but some are the smaller ones. Thanks for showing that process as I’ve always wondered..
What an interesting post. That’s amazing that it takes 3 years to make the barrels. I had no idea. Like you mentioned on the bean-shelling post, it makes you realize why the price of some goods are what they are, and makes you wonder why they’re not more. What a beautiful post! 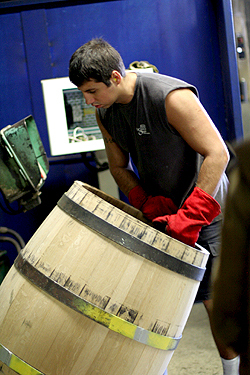 As a Kentuckian, I can attest that the barrel-making process is very similar for bourbon (although, alas, our coopers are fully clothed while they work!). JB: Yes, you’re right. Part translates as “share”, as well as “part”. Baked Alaska: I was amazed. And most of the Cognac-makers can’t reuse the barrels since they’re infused with the flavor of the previous batch. 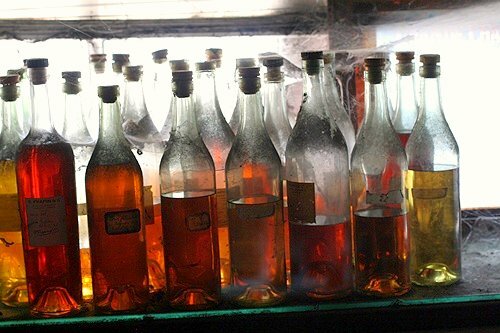 Some places sell them to rum-distillers, who like those flavors infused in their liquors. I am sorry you are having internet communication problems in Paris, but as my Grandmother used to say “maybe it is a blessing in disguise” because we have the good fortune of reading your blog posts while you travel around outside in the country with your fabulous reporting and photography. I feel like an armchair traveler reading the Cognac post. For example I know you have past posts from outside Paris but I would love to read more about Calvedos and the French recipes with apples, the countryside cheese caves, the Fall harvest, and the hundreds of interesting stories and recipes that come from thousands of years of harvests from the French countryside. Sorry about the “FIM”, I enjoy your posts from Paris but the countryside posts are equally fascinating. which I can not vouch for at all. This is so cool. I got a tour of a place that was making barrels not far from Calistoga/Chateau Montelena in the early-1980s while spending most of a year touring wineries one day a week in preparation for a four-page center spread on wine in my college paper. Great year — and I even ended up as a vineyard worker for Cliff Robertson on an episode of Falcon Crest. 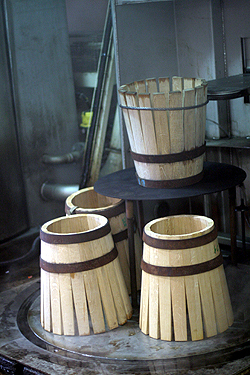 :) It was called Tonnellerie Francaise French Cooperage of America, and their web site is here: http://nadalie-usa.com/default.asp It was so cool to see the various steps of the process. Thank you for that wonderful report. I have classes (I teach English in a Hotel & Restaurant School in Estonia) with our school’s service groups later this autumn and I want to use that in my lessons. The language is clear and straightforward and the pictures are super. I do hope that while you were in the Cognac region you had a chance to taste Pineau des Charentes, the aperitif du coin, made from cognac. If not, you’d better go back to try some. Thanks for a great post! Jan: I LOVE pineau des Charentes. 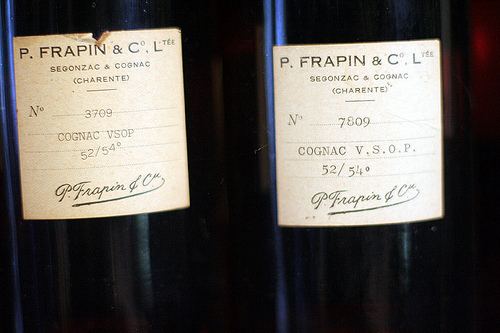 We didn’t taste them because most of the time we were focusing on Cognac, but we had an amazing aged one at Cognac Ferrand that would hold it’s place next to many of the great dessert wines. I’ll try to read again later, thanks for the wonderful eye candy! In Henry McNulty’s “Drinking in Vogue,” he tells how the occupying Germans were always able to find hidden stores of cognac by looking for black roofs from a high perch. It turns out that the fumes evaporating from the barrels caused a black fungus to grow. Ooooooooooooooh David. Lots of handsome men in these photos – the last photo especially!!! I love that picture – so elegantly dressed, so debonair with your cognac in hand! I don’t know the right photography words – but the soft focus w/twinkly lights in the back and then you so sharp in the front! Perfection!!! Question: we have a 50 year old bottle of Armanac we inherited from my husband’s parents. Does anyone have any idea whether it’s potable? Deadly? Something else? David, don’t assume you’d escape phone and internet problems in the States. Recently my ISP forced me to start paying for their very expensive business service because I access my business website for emailing via my home connection. While at it I also ordered their phone service. After a month, when they’d never bothered to properly connect either one I declined to pay the bill and halted the “service.” They said they’d think about it. Ah, Numericable, who keeps stuffing my boite postale with flyers pronouncing that they fix problems within 7 days! Within 7 days of *what*, I wonder…. Libbie: At least you can call someone and get some action. I’ve been calling my provider for weeks (paying 34 cents/minute), with no success. Although American-style customer service does have it’s flaws, too; I recently ordered a camera through Dell’s website and when they told me it’s not in stock, they also told me that I couldn’t cancel the order on their website, that I had to do it by phone. And that took a couple of weeks, just to get through to a real person. Even then, it took quite a bit of finesse to cancel. Sunny: Oddly, I keep getting those “Tell Us How We’re Doing!” flyers from Numericable. And underneath is the fine print, that it costs 34 cents/minute to call and tell them. I can’t imagine anyone paying €5-€6 them to tell them how they’re doing…although it’s awfully tempting! hi sorry for leaving a comment here on a post of long ago! i tried to comment there but was not alloowed the option. i wonder why. anyway. this is regarding the devils food cake recipe. i have an almost identical recipe that works very well too, the only difference being the use of curd (yoghurt / buttermilk) instead of milk. Could you tell me whether there is a difference in using either, and if yes, what is the difference? i have seen references to your blog at many popular bloggers – esp deeba’s. am glad i came here! 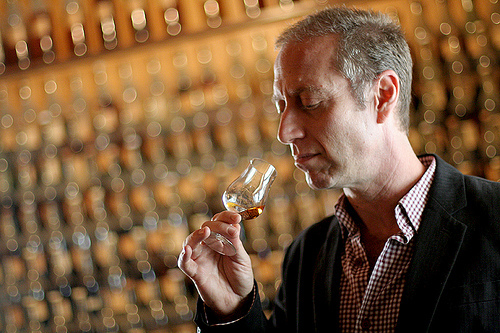 Thanks so much for the fascinating reportage on cognac—and cute coopers. Whenever I’m wondering if I’ll ever fulfill my dream of returning to live in Paris once again, I come to your blog and see what’s causing your latest FIM (only makes me feel better for a short while though). Have you tried my fave beverage, pineau des Charentes (an aperitif that’s a combo of new wine and cognac eau de vie)? So, David, when is your new *Dieux du Doeuv* calendar coming out (followed with the behind scenes dvd)?! 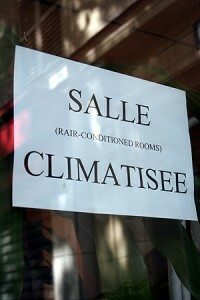 Oh…waiting for summer…smart…tout saisons…can’t wait. Mon pauvre … I feel your pain. Numericable is truly a cauchemar as I’ve learned firsthand. My tv/phone/internet all went down recently too. In August! I thought it was hopeless, but discovered that the people working at Chez Numericable on La Place de République can actually be quite friendly and helpful. Here’s the secret … go in around 12h45. Seems the French would never squander their lunch hour running errands. The place was nearly empty instead of the usual 2 hour wait. Bon courage. Good for you for giving the boot (or trying to!) to Numericable – they are the absolute worst. I’d been with them since 1991, and recently moved everything to Orange/France Telecom. Numericable used to be called Noos, one of the silliest brand names ever … it was a play on words with “news”, but it always made me think of the word “noose” and was thus a perfect metaphor for my relationship with them. Though two of the other silliest brand names belong to France Telecom: Wanadoo was their first ISP brand (“what do you wanna do?” beurk) and their first “mobile” phone product for ordinary folks in the mid 1990s was called Bi-Bop (if you ever see a decal wrapped around a lamp post or telephone pole with a light blue and green stripe, that was one of the Bi-Bop “bornes” where you had to stand to call on your mobile!). The good news is that I have electricity again in my bedroom. My electrician just left, with his charming new assistant, and after asking me “What kind of ice cream do you have today?” they fixed my problem, pronto. Let’s here it for the power of les glâces! Marlowe: I am quitting them at the end of the month. That takes 2 certified letters, but at least I’ll be outta there. Hopefully..
jon: Actually I did tell them they should do a calendar. Of course, they had no idea what I was talking about. But if they ever need to pick up some extra money, I’d be happy to go back and snap some more pics for them. Fascinating article, enjoyed the photos! I totally agree with the most comments here, the pictures are so great that it tells all. 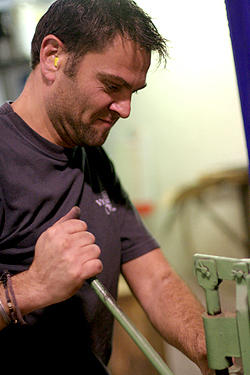 I learned that it takes some hard work to make a good Cognac. Love Cognac, visited the region many years ago, at ” Camus” and love the carmel flavor! Hard to find here in the San Francisco, Marin County areas. If you know of any place, please let me know! 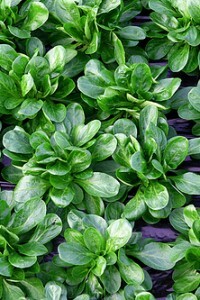 David, Your post was not only beautiful to look at but shared really cool information. 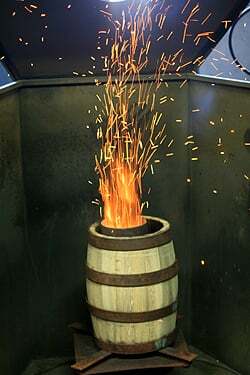 I live in Napa and work for a winery so I know a little of how cooperage works. 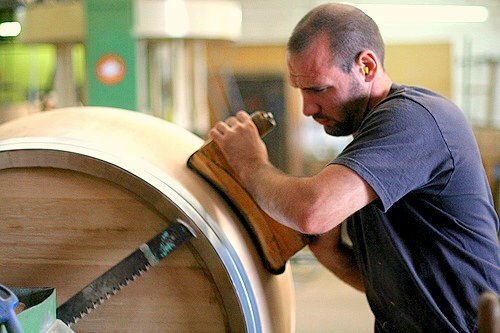 All that artistry must be why the French Oak barrels are so coveted here. And thank you so much for your dedication to your devoted readers. Were it not for your tenacity to find connectivity throughtout France we would surely be deprived. I hope that gets resolved soon! I love this post! It’s great to see traditional crafts alive and kicking and I particularly love the phrase ‘Part des anges’…..a French friend of mine recently introduced me to the phrase ‘petit nuage de lait’…….a little cloud of milk (for one’s tea or coffee)….thanks for this story, David, and bon chance with the FIM!! This is such a wonderful uncovering of how the most artisan of cognacs are produced. Thank you so much for taking the time to sample all parts of the process for us. It’s amazing you were able to make it out of there with such a clear memory of the experience, but I guess that’s what these beautiful photographs are for as well. 70 years? That’s got to be special. Wow that is a lot of work that goes into making Cognac. I bet it tastes nice after all that work.